It’s always an occasion of note when Paul Krugman says a true thing. Abused power is indeed potentially catastrophic. Perhaps there is an alternative to creating the moral hazard in the first place? If you advertise the position of dictator, you shouldn’t be surprised when the wrong kind of person applies for the job. The hashtag #NeverTrump should really be #NeverRiskAnotherTrump.The idea of an “elected dictator” is completely inconsistent with any classical understanding of freedom. And this has been going on a very long time, kicked into high gear by the Progressives at the turn of the twentieth century, the very people who built the machinery of power to intervene in every aspect of economic life. On any other day of the week Krugman celebrates exactly these powers for purposes of macroeconomic management and property redistribution in the name of equality. Yes, we could observe many instances in which similar observations could have been made about non-Republican presidents, times when Krugman’s moral righteousness fell silent. The hypocrisy of the lefty Trump haters is palpable but, by now, rather boring. 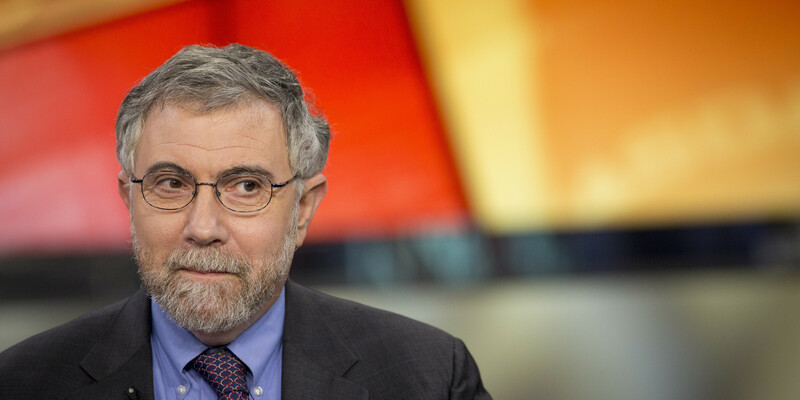 For my own part, I’m happy to welcome Krugman to the anti-fascist brigade. The frequent association of fascism with racism is not accidental. I can only hope the experience of the last six months has inspired him and his colleagues to rethink their vision of government and its relationship to the rest of society. The hashtag #NeverTrump should really be #NeverRiskAnotherTrump. And the only way to eliminate that risk is to cut the presidency itself down to size. But what of Krugman’s observations that fascism is alive and well in the White House? I really do wish we could use this term dispassionately – an absurd hope, I am aware. But it really does have a substantial meaning in the history of ideas. The ideology began in revolt against the rise of laissez-faire, as a rightist faction of the new-born Hegelianism in Germany, grew throughout the 19th century with the addition of Great Man politics, protectionism, social planning, corporatism, love of violence, and nationalism. The frequent association of fascism with racism is not accidental. Race is one factor that demagogues use to unite a nation under a leader with totalitarian powers to plan a nation’s demographics. Once you concede that it is up to government to preserve and protect a certain racial composition of a nation – treating people as if they are lab rats in a zoological experiment – all bets are off. Racism becomes an ideology with an imagined hell, heaven, and means of avoiding one and bringing about the other. Add the element of pseudo-science that came in the late 19th century and you have the perfect storm that culminated in the monstrous politics of the interwar years and finally a world war. Fascism involves more than Krugman knows.But bad ideas are not blasted away with war victories, as we have learned over the last ten or so years when fascist politics have made a roaring comeback. In our own times, it took awhile for even intelligent intellectuals to catch on, simply because the rhetoric typically deployed by the fascist party is superficially anti-left, which in our confused ideological times, masquerades as “conservatism.” We are so easily thrown off the trail with this nonsense. Fascism involves more than Krugman knows. Ethnic cleansing, executive centralizations, and police-state impositions are part of the mix. More fundamentally fascism rejects and resents the whole social trajectory of freedom, which is always about emancipation of people from all forms of power, social control, and material deprivation. Fascism is one form of revolt against laissez-faire while socialism is another. So similar are they in practice that history has given us violent hybrids such as the National Socialism of the Nazi Party itself. Krugman’s political instincts need to undergo a transformation of belief.It is possible to train one’s political instincts to the point that you can recognize fascism even in its nascent form. It should have been obvious enough from July 2015 that this is precisely what was going on with the Trump campaign, which opened by railing against free trade, fostered paranoid immigration fears, and promised better, harder, tougher management of the nation from the center under a Great Man. For anyone who recognized this at its inception the last six months have been like watching a train wreck in slow motion: the track was a given, the victim immobilized, and the trajectory unstoppable. What I would truly love to see is people with Krugman’s political instincts undergo a transformation of belief. We need to progress to the point that we are no longer condemning power when it is used by the other guys in ways we do not like but rather condemning the existence of the power itself regardless of how it is used. And why? Precisely to prevent the kinds of abuse that the right sees when the left is in charge, and the left sees when the right is in charge. We’ve got three and a half more years of this administration, which also means three and a half more years of center-left critics of Trump decrying his dictatorial use of executive powers. Is it too much to hope that this experience will be enough of a shock finally to disrupt the belief systems of people like Krugman, even to the point of revisiting the ideas of the classical liberals who warned about all of this so long ago? It’s doubtful. Still, we should never give up that hope, if not for Krugman but for all those coming of age during these traumatic times. My sentiments exactly, and I’m willing to bet we’ll see even worse men than Trump grasping for the reins of the all-powerful presidency in the future.